I am very lucky in the fact that having a custom build is an option to me, as well as being close to Condor Cycles in London. I fell in love with the concept of a custom build bike at the Cycle Show at the NEC this year as well as the look of the Acciaio which I saw on the Condor stand. I had looked at the usual suspects. (Specialised, Giant, Trek etc.) but none of them had the soul I was looking for. By the time they were broken in they would have been replaced by tapered head tube versions, different paint job versions, versions with the same shimano groupset but with different decals etc. The Acciaio fitted the “timeless” bill. Condor offered something different. It was not without it’s compromises. Take a bike off the shelf and you will get technology for a price point, whether it be integrated bottom brackets or hydroformed aluminium tubing. What you get with a custom bike, is to pick tried and tested combinations of components that work with a frame. The selection process was fantastic. I had read Robert Penns book. See previous post and decided on steel. I have ridden steel before and it has a certain feel. I adorned the Acciaio with some Mavic Aksium wheels, a Campag Centur groupset and deda finishing kit. A matching Fizik Saddle and Handlebar tape combo was picked and then i was put onto the jig where the saddle height, crank length, stem length and bar width were calculated. 4 weeks later the bike arrived! and here it is… I have put about 100 miles on it and genuinely belive I will still own it in 10 years time. 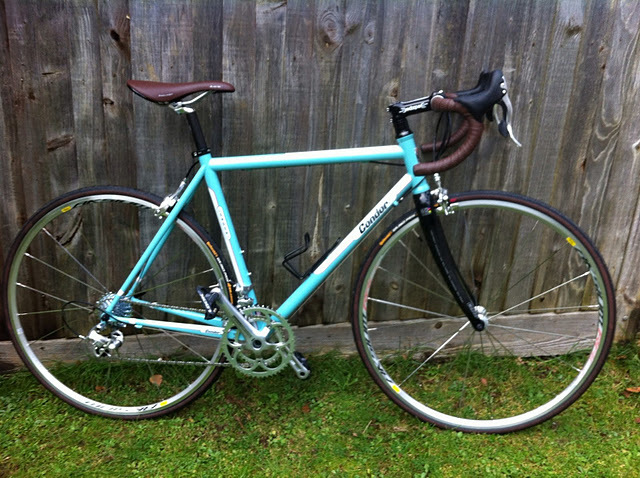 I’m just specing up my Acciaio (very exciting) could I ask what saddle / bar tape you’ve got on there, was looking at brown but a lot look a bit orange but this looks great. The saddle is a fizik Aliante Delta Brown. The bar tape is Fizik mictotex brown. Not to be confused with the honey colour they also do which is more orange.